At Hearing Services of Antioch, we understand that your experience with hearing loss is a personal, and often sensitive one. When you book an appointment with us, you can be rest assured that you will be given the individual time and attention this process demands. You will have ample opportunities to get answers to any questions you have, and we are happy to review information to make sure you thoroughly understand it. Scheduling your first hearing exam is a big first step, and we want you to feel extremely comfortable and at ease throughout the rest of your journey. Whether you have booked an appointment for yourself or for a family member, it is important to have pertinent medical information on-hand. Just like most other medical appointments you have had, we will ask you to fill in some intake paperwork. You will want to be prepared to explain your past and current issues with your ears – including pain, feelings of fullness, tinnitus and of course your hearing concerns. Please also prepare a list of current and past medications. Certain medications have been known to be a risk factor for hearing loss, so it is imperative we take your medication history into account. Before running any hearing assessments, it is important that we check your or your family member’s ears for any physical issues that may be playing a role in the hearing concerns – such as earwax buildup or polyps. The specialist will use a tool called an otoscope to look into the ears for any abnormalities. You have probably been examined by an otoscope before during most routine doctor’s appointments. Expect to be given a simple, painless hearing exam. This assessment helps our specialists understand the volume at which you can or cannot hear sounds. During this test, you will be asked to wear headphones and simply raise your hand or push a button whenever you hear a sound. During this assessment, we will be looking at your ability to interpret speech. This exam is great for identifying early hearing loss, as speech understanding is typically one of the first signs. During this assessment, you will be asked to listen to speech through headphones and will be asked to repeat it. Depending on your needs, distracting noises may also be included in the recordings. This one is very simple. During the bone conduction test a small vibrating probe is placed against behind your ear and against your skull. This helps us better understand how your inner ear perceives sounds through your bone. Trust us, this one sounds much scarier than it is – we promise it is truly painless! Prepare questions, and expect to review your results. You do not have to schedule a second appointment to review your results – we will be able to go through them immediately after the assessments are finished. 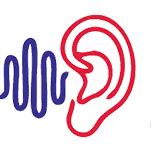 During this time, we will discuss your personal hearing profile – including strengths and areas of need. We will also take the time to discuss potential treatment options. If it is recommended that we treat your hearing loss with hearing aids, we will also discuss hearing aid options at this time. If you have done any research and have a few hearing aids you think might work for you – we can also discuss how these fit your hearing profile at this time. We will work together to combine our expertise, your preferences, hearing profile, personal style, budget and lifestyle to determine a solution that will work best for you. This is also the time to being up any questions you have regarding tinnitus, hearing loss, or any other concern you may be having. There is no such thing as a silly question; we want you to feel truly comfortable in our office. If you forget your question – no worries. Call us any time after your appointment and we will be happy to answer it for you.